Keely was splitting the molecule and atom in the 1800s - 50 years before conventional science. No wonder no scientist or engineer of his day had any clue what he was doing. "One is an assembling or associating force, an assimilative force of gravity, or growth, which causes mass to draw together, to integrate, to accumulate. The other is a disassembling or dissociating force, and eliminative force of emission, which causes mass to emanate, to separate, to disintegrate. "The purpose of magnetism is to replace that which electricity has displaced; to dissociate, disassemble, diffuse, disintegrate and radiate that which electricity has associated, assembled, integrated and generated. You know, too, that since the Infinite Eternal IMPULSES are contained in a state of mutual restraint, these IMPULSES are of an unimaginable intensity of energy - against which your atomic energy contained within the splitting of an atom is a mere 'pouff', an infinitesimal twitch of no importance. 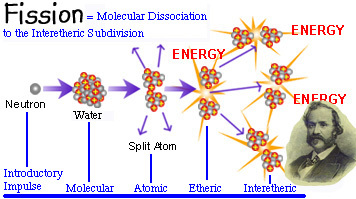 HISTORY OF THE DISCOVERY OF THE DISSOCIATION OF MATTER, AND OF INTRA-ATOMIC ENERGY.